1660 sq. 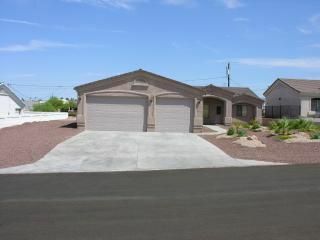 ft. 3bd/2bth furnished home built in late 2006. Sleeps 6 adults in beds and multiple kids/adults in the living room area. the house. Non smoking and no pets please. Boat/RV parking available along the side of the house. Great location! House was clean and worked great for our family weekend!! This house is very nice. Very comfortable and roomy. Ed and Kathy were great to deal with. The home is very comfortable and we'll maintained. Very well stocked with towels and linens. Probably one of the best deals in Havasu. We will definitely rent again. We are glad that you enjoyed your stay. We look forward to having you come back. Enjoyed our stay at Ed & Kathy's Lake Home very much...they are great people to deal with! Location was ideal, quiet and only steps away from walking trails in the hills. Hopefully we will be able to stay again next winter! After staying here for three winters we could not have been happier. Only giving it up because we have purchased. A home here. Any little problems we had were taken care of immediately. Ed & Kathy were super to deal with.. Absolutely amazing house and great location. Was able to pull my boat into the garage at night and fit my truck as well. House was very clean inside and extremely bright when we pulled up late at night. Can't wait to come back again and stay here. Spacious, clean and modern retreat. The grand room is very spacious. The dining area, living room and kitchen is open with high ceilings. Lots of windows and great lighting. Bathrooms and bedrooms are clean and modern. Lots of parking space and garage is wide with high doors. Carpet inside is very clean and soft. Only reason for missing five stars is the backyard. There is no fencing in the back and is open to the street. We stayed indoors so it didn't bother us. Well maintained and will rent here again.